Unusual weather conditions during cultivation of the 2018 corn crop will increase the risk of mycotoxicosis in herds and flocks in 2019. Dry weather occurred in Kansas, Missouri, Iowa and Oklahoma during the current season. Drought during the silking stage stressed plants and created an opportunity for fungal spores to infect kernels. Drought is usually associated with Aspergillus contamination resulting in elaboration of aflatoxins. Wet weather also subjected crops to infection with fungi especially during the dough and harvest stages. Crops harvested with a high moisture content may contain fumonisin, vomitoxin, and zearalenone which although individually present at low levels will have a synergistic effect. Suppliers of mycotoxin binders including Alltech, Biomin and Nutriad are warning clients of the risks of mycotoxicosis from the 2018 harvest. These companies have established programs to monitor the level of mycotoxins in corn and DDGS. Aflatoxin may be concentrated threefold in DDGS compared to the corn feedstock during the production of ethanol. Producers are advised to monitor moisture content and regard corn with a level higher than 15 percent as potentially contaminated. Sensitive, semi-quantitative rapid assays are available to monitor for the major mycotoxins of clinical significance. It is emphasized that sampling error can invalidate results with both unjustified rejection of a large consignment or alternatively acceptance of a shipment which may be deleterious to flock or herd health or product quality. Over half of new crop corn has been harvested and early indications suggest that assay for mycotoxins is justified. Remediation of affected corn is extremely difficult although it is possible to dilute a contaminated batch if it is not rejected, by proportioning with an unaffected consignment. 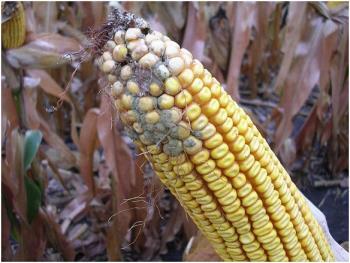 Corn with a moisture level in excess of 15 percent can be treated with a proprionate compound to suppress fungal proliferation but these additives will not ameliorate mycotoxins which were elaborated before harvest. A mycotoxin binder derived from yeast cell walls is available to supplement diets prepared with contaminated grain. The product is extremely effective against aflatoxin but with relatively lower efficacy against DON and trichothecenes. The bottom line is that mycotoxicosis will be a reality in late 2018 and early 2019 and producers should be aware of the risks and implement appropriate monitoring and remediation programs.